The methylidyne radical (CH) is a hydrocarbon combustion intermediate of great importance in the prompt formation of NO, a highly regulated pollutant. Recent work in modeling the combustion chemistry of NO has highlighted the need for further study of CH and its associated high-temperature chemistry. 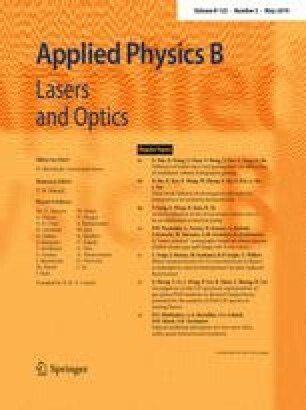 This paper details the new development of a fixed-wavelength, cw laser absorption diagnostic for measurements of CH at high temperatures behind reflected shock waves. A detailed spectroscopic model was utilized to predict CH absorption within the A ← X band of CH, and the broadening coefficient of the selected blended transition was measured in a series of fixed-wavelength measurements. A demonstration of the diagnostic was performed in highly Ar-diluted C2H6/O2 and CH4/O2 mixtures between 1750 and 3050 K near 101 kPa. For both mixtures, experimental peak levels of CH were found to be generally overestimated by 40–80% by two chemical kinetics mechanisms. Such discrepancies highlight the need for further refinement of CH chemistry, which could be facilitated through future applications of this diagnostic and through the data provided herein. To the best of the authors’ knowledge, this study provides the first CH profiles measured in C2H6 oxidation. The online version of this article ( https://doi.org/10.1007/s00340-019-7188-x) contains supplementary material, which is available to authorized users. This work was funded in part by the TEES Turbomachinery Laboratory and the Aerospace Corporation’s Internal Research and Development program. A critical portion of the CH diagnostic setup was funded by Siemens Canada, with Dr. Gilles Bourque as project monitor. Additional funding came from the National Science Foundation, Grant Number CBET-1706825. The authors wish to thank J.L. Elms for significant contributions to the preparation of this manuscript.